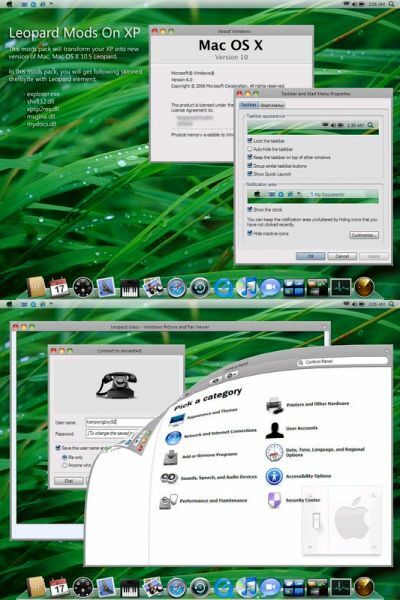 Got bored with your old Windows XP interface?, Now you can enjoy Mac OS X Leopard interface on your Windows XP SP2 system using the free "Leopard Mods On XP", unlike many other theme packs this is not just a theme but a full mod changing core system files and behavior. - Please make backup before replace your system files. - These mods pack can only work in Windows XP SP2 ONLY (English version, other language doesn't support ). Yeah right the instruction and the works does the change but only for XP's Icons alone... it won't make XP look and feel like Mac. Why would you want to replace an adequate and proven interface, with a poor implimentation? with a more clunckier feel than the original, eg. XP shell32.dll (8MB) - Replacement shell32.dll size(27MB) - try it and feel the power...... or lack of it.. Didn't broke my computer, maybe it's because you don't have XP? windows search "system restore" and create a restore point OR use a backup utility. can u make this compatible with Xp Sp3? idk, its not working very well. I can't able to download from this server...! How do we download the skin i saw the cool skins and stuff but how do you download it??? When i open replacer it says file not found! blah blah blah! how about for xp service pack 3? I tried this and it look like it only did part of the install. The icons changed and the log in window changed but the background did not and it still has the format of XP… maybe I am doing something wrong… if anyone can help please email me at bhavna.rana@mail.com and yes is the animations that was on the screen shot available meilleure page de casinos, I am downloading it tonight, and can’t wait to try it!!! Hey i'm runnin Win Xp Sp3. will this is run in ma machine. how to uninstall this leopard mod?? I WANT THE MAC OS X GENUINE& ORIGINAL THEME.PLEASE PROVIDE THE THEME FOR ME.I HOPE U WILL PROVIDE IT FOR MY SELF OK BYEEEEE. have done your instruction but no effect and changes happened. except for some icons. I have been trying for 2 days to install this theme on SP3 machine with no success. Any window that is not "maximized" seems to relocate off screen where it cannot be accessed. Overall it seems that a tremendous amount of work went into this theme so I do not want to write a negative comment about it, but I cannot be the only person that has this problem of windows relocating off screen. how do i download it ??? Download MAC OS X Leopard, it's cool. Mac os x Leopard it's great beautiful skin for my windows. I've already followed the instruction but it doesn't work properly. Some icons have changed. That's all. this thing make my fifa 11 going stupid and ugly !!!!!! sir, we are trying to install this on safe mode but i could not install plz tell me the process from beginning ,i how can i install . please i want to install mac os x lion on my laptop but i don't know how please e-mail me the tutorials. thank you. I installed Leopard Xp yesterday. I want to Get back the original view of Windows 7. Even though I uninstall it but getup is not changing. What should I do?